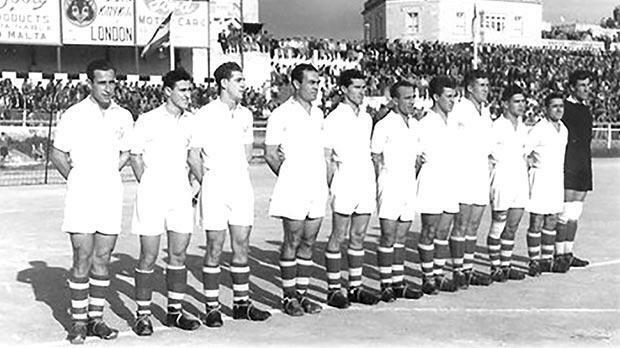 The Malta FA XI (January 6, 1950 – left to right) Leli Zammit, Lolly Borg, Pullu Demanuele, Tony Nicholl, Eddie Cole, Ġużi Bennetti, Benny Camilleri, Sunny Borg Cardona, Salvinu Schembri, Gejtu Sacco and Wenzu Gabaretta at the Gżira Stadium. In 1949, the organisers of the Christmas tournament treated the local fans to a feast of football. FC Wien, of Austria, and Red Star Belgrade, from former Yugoslavia, were invited to take part in a triangular tournament apart from flexing their muscles against the leading Maltese teams at the moment. FC Wien started their commitments on Christmas Day against St George’s. The Austrians took some time to settle. St George’s even grabbed an early lead but once the visitors had found their feet, they brushed aside the Saints’ challenge and won easily by nine goals to one. On Boxing Day, Wien played Valletta FC. This time the opposition was stiffer. The good work of Valletta’s new coach, Harry Tedder, was evident as the Whites surprised everyone with their stamina and determination. The Citizens started well but it was Wien who opened the scoring as Srb’s free-kick from 30 metres out sailed past Wenzu Gabaretta. Then, in the 35th minute, Sigmund swerved a perfect shot into the net. Two goal in arrears and yet Valletta refused to give up. They kept up the challenge and were rewarded for their persistence with a Ġużi Vassallo penalty. This goal served as a tonic for Valletta and for the rest of the game, they forced Wien to defend grimly. In the dying stages, Pace should have scored the equaliser but when through on his own he shot straight at the goalkeeper. On New Year’s Day, Wien met Floriana. The heavy rain which greeted the new year turned the pitch into a pool of mud. Both teams had their chances but in the second half, the Greens slowed down considerably, allowing the Austrians to gain the upperhand. It was therefore just and fair when Sigmund scored the goal which gave the visitors a merited but hard-won victory. FC Wien completed their preparation for the tournament with a 2-1 victory over Sliema Wanderers. The Blues broke the deadlock early in the first period but two mistakes by goalkeeper Lolly Rizzo gave the visitors the verdict. Red Star played their first match against the Wanderers. The strange conditions did not seem to bother them at all and at the end, they fully deserved their 3-0 victory. The skills of the Yugoslavs were again in evidence on December 28 when they faced Floriana. The Greens tried their best to match their opponents in skills and to a certain extent they succeeded. They were, however, never able to pierce the impregnable Red Star defence. Antic and Tomasevic gave Red Star a 2-0 lead. Johnnie Alamango reduced the deficit from a penalty and, inspired by this goal, Floriana attacked strongly. The pace began to tell, however, and the defences began to dominate on the attacks. At the end, both teams seemed satisfied with the 2-1 scoreline. Very few people saw Red Star beat Hibernians 5-0, and a game without spectators loses much of its interest. The Yugoslavs controlled the game from start to finish but Hibs did create a few scoring chances. Against Ħamrun Spartans, Red Star took only eight minutes to race into a 2-0 lead. They were in an irresistible mood and before the interval, they had scored four more. The second half was more or less a repetition of the first. Tomasevic added five more goals, bringing his total to seven and after that, Red Star ran into double figures with great ease. Ħamrun did not know what had hit them! They left the field dazed, bewildered and humiliated by the record score of 14-0. Meanwhile, the first match of the tournament was played on January 6, 1950. Red Star presented bouquets to the MFA XI players but apart from flowers, the Maltese were given a lesson in the art of playing football. Red Star won 10-0 leaving the Maltese defence in shambles. The following day, Red Star and FC Wien shared the spoils in a 0-0 draw. Despite the lack of goals, the game was keen and thrilling and at the end the huge crowd at the Gżira stadium stood up to applaud the two protagonists. FC Wien now needed to beat MFA XI 11-0 to win the tournament. Nobody doubted that the Austrians would beat the local selection and, before the match, huge scores were mentioned. Few people were prepared to bet their money on the national team. The Maltese, however, finding themselves with their backs to the wall played the game of their lives. Fielding practically a new team, the MFA XI obtained a creditable 1-1 draw and with a bit of luck they could even have won the game.